Dates for the High Peak Wilderness First Aid Modules 1-5 are on the courses page up until Christmas. Modules 1 and 2 are suitable for those taking national governing body awards. Modules 1 and 2 comprise of 16hrs and have been accepted by the major governing bodies for sport since 1997. These outdoor first aid courses are held every Wednesday and Thursday and every weekend throughout the year apart from bank holidays. The modules are structured in a progressive way and were developed to give more depth of knowledge, to improve competency at performing the basics well and to develop more advanced skills. Module 3 is suitable for those going overseas to more remote areas in particular to countries that may be affected by natural disaster. Modules 4 and 5 do not give a licence to practise invasive skills. The aims of these two modules are two-fold: firstly to develop expedition leader’s to aid a medical professional in a remote environment and secondly, to develop competency in advanced skills, group management, leadership, delegation and decision making in remote or hostile environments. 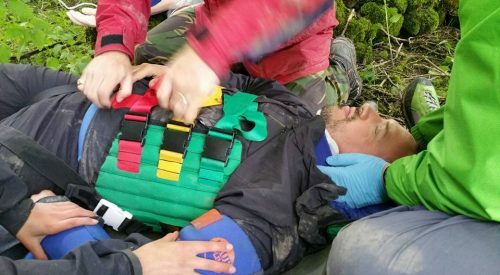 The High Peak Wilderness First Aid Modules 3-5 are held every month throughout the year and are also attended by medical students which adds to the variety and depth of knowledge shared on these first aid courses.